Interstate 495 is the outer beltway serving Boston metropolitan area commuters. Cities directly served by I-495 include Lowell, Lawrence and Haverhill. The highway also provides part of a bypass route from the Mass Pike south to Cape Cod and north to the New Hampshire Seacoast. Until 1996, Interstate 495 was the longest three-digit Interstate highway, when Interstate 476 in Pennsylvania was extended north from Plymouth Meeting to Clarks Summit. Interstate 495 north at the trumpet interchange and access road to the Mass Pike at Westborough. Photo taken 10/06/14. Plans for 2021 or beyond call for improving the I-90/495 interchange. 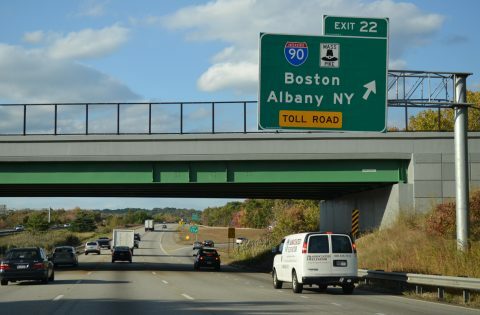 With the Mass Pike switching to all electronic tolling (AET) on October 28, 2016, the toll plaza between the two trumpet interchanges linking the beltway and toll road is no longer needed. The removal of the toll barrier will allow the addition of flyovers or other high speed ramps to eliminate some of the weaving traffic patterns currently in place. Interstate 495 was built in segments between 1958 and 1982.1 The route ended at Interstate 95 in Foxborough from the north until June 17, 1975, when AASHTO approved the southeasterly extension to Interstate 195 at Wareham. With mileage gained from the cancellations of both I-95 along the Southwest and Northeast Expressways through Boston, and the Inner Belt Expressway for I-695, the I-495 extension superseded Massachusetts 25 1 Interchanges were renumbered to start at Wareham instead of Foxborough. Massachusetts 110 provides a Breezewood style connection to Interstate 95 south from I-495 north. The four-lane arterial leads east from Exit 55, three quarters of a mile to a parclo interchange with I-95 in the town of Saulsbury. Photo taken 07/30/07. The remainder of Interstate 495 north defaults onto I-95 north into Seabrook, New Hampshire in one mile. A pair of ground level signs replaced this overhead assembly. Photo taken by Jim Teresco (11/18/01). An end shield formerly posted at the wye interchange with Interstate 95 north. I-95 transitions to the tolled Blue Star Turnpike in three miles. Portsmouth lies 16 miles to the northeast. Photo taken by Jim Teresco (11/18/01). The first sign for Interstate 495 south appears in the town of Seabrook, New Hampshire, two miles ahead of the split from I-95 south. Photo taken by H.B. Elkins (06/01/13). Just across the state line, a second diagrammatic sign outlines the forthcoming wye interchange (Exit 59) with Interstate 495 south. The initial stretch of the 120.58 mile beltway parallels the Merrimack River west through the towns of Amesbury and Merrimac. Photo taken by H.B. Elkins (06/01/13). Continuing south from the wye interchange (Exit 60) with the connector to MSR 286 and U.S. 1 in Salisbury, drivers proceed one half mile to Interstate 495. I-495 loops southwest 11 miles to Haverhill while I-95 advances south to the John Greenleaf Whittier Bridge across the Merrimack River. Photo taken by H.B. Elkins (06/01/13). Interstate 495 travels southwest to Lawrence, Lowell, and Marlborough before returning southeast toward Cape Cod. Connections with Interstate 290 in 60 miles provide a direct route to Worcester. Photo taken by H.B. Elkins (06/01/13). For photos showing older signs for the north end of Interstate 495, see Interstate 95 South – N.H. to Peabody at AARoads. Leading away from Interstate 95, a begin shield stands along I-495 south by the Amesbury town line. Photo taken by H.B. Elkins (06/01/13). Southeast into the town of Wareham, the final two miles of Interstate 495 traverse an area of wetlands dotted by cranberry bogs. Photo taken 07/28/07. Advancing south of the Weweantic River, a second diagrammatic overhead outlines the forthcoming trumpet interchange (Exit 1) with Interstate 195 west and the freeway continuation onto Massachusetts 25 east. Photo taken 07/28/07. Interstate 195 arcs southwest from I-495 and SR 25 to Mattapoisett and New Bedford. SR 25 continues the freeway 10.04 miles east to U.S. 6 at Buzzards Bay. Photo taken 07/28/07. Interstate 195 travels 45 miles west from Wareham and I-495 to Fall River and Providence, Rhode Island. Photo taken 07/28/07. An end sign advises motorists of the southbound transition of I-495 to SR 25 east. SR 25 provides a direct link to the Bourne Bridge across Cape Cod Canal and SR 28 south to Falmouth. Photo taken by Jim Teresco (08/29/01). Massachusetts 25 west transitions into the northbound beginning of Interstate 495 within their trumpet interchange (Exit 1) with Interstate 195 west. Photo taken by H.B. Elkins (05/31/13). Outer Circumferential Highway (I-495). BostonRoads.